There is a large shared communal swimming pool, different with views of the Mediterranean Sea. It has grassed areas, showers and toilet facilities. There are communal gardens and a children's play area. The community is gated and entrance is by key entry. The apartment is just a few minutes drive from the nearest beach and coast road which leads to many secluded or activity packed beaches. The famous La Cala de Mijas is a 5 min drive and there are miles of beaches leading to Marbella which is just 20 minutes along from there. En-suite bathroom to bedroom 1 with bath, shower, basin, wc and bidet. Family shower room basin, wc next to room 2. Large living room with 2 sofas. TV, DVD, player. Patio doors lead out onto the magnificent private terrace with views of the pool and sea. Modern fully equipped dining kitchen with large fridge/freezer, electric oven and hob, microwave, toaster, kettle, dishwasher, washing machine cafetiere and seating area. 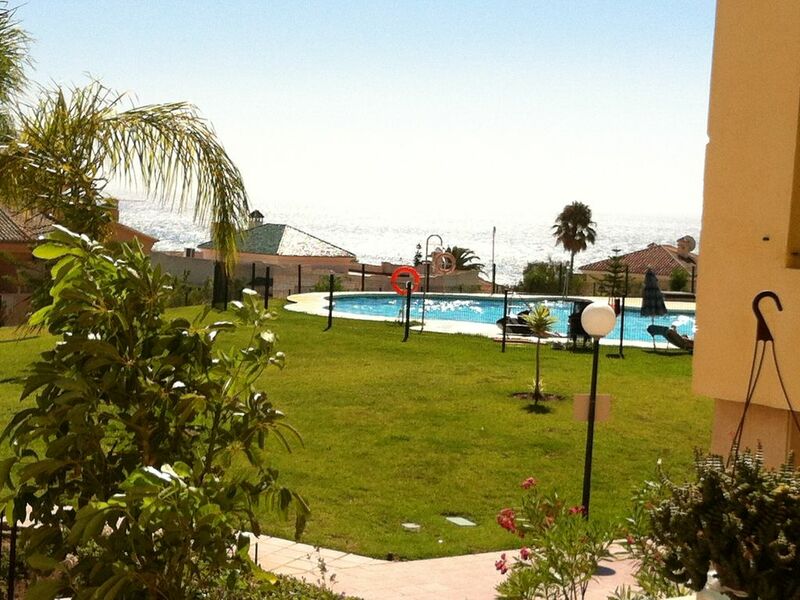 Outside: There is a large shared swimming pool, with views of the Mediterranean. All have grassed areas, offer areas of shade and toilet facilities. There are communal gardens and a children's play area. The community is gated and entrance is by key entry. Utility Room: The washing machine is based on the balcony outside the kitchen otherwise known as a utility room. Cleaning / Towels / Linen / Maid service: Bed linen/towels are supplied for use in the apartment only. Please bring your own beach towels. The apartment is cleaned and linen/towels changed weekly. Our on site manager is there to help. Additional cleaning can be arranged for a supplement. The apartment is just a few minutes drive from the nearest beach and coast road which leads to many secluded or activity packed beaches. The famous La Cala de Mijas is a 5 min drive and the miles of beaches in Marbella are just along from there. The nearest airport is Malaga and it is an 30 minute drive to La Cala there are several car hire companies within the airport complex. La Cala is a small old Spanish village with many bars, restaurants and shops.